WE'RE BACK from a few days in California attending a great symposium put on by the 2e Center for Research and Professional Development at Bridges Academy. Watch for coverage in the next issue of the newsletter. Two focuses (foci?) were honoring pioneers in the 2e community and providing a forum for those running 2e-friendly schools to share information. 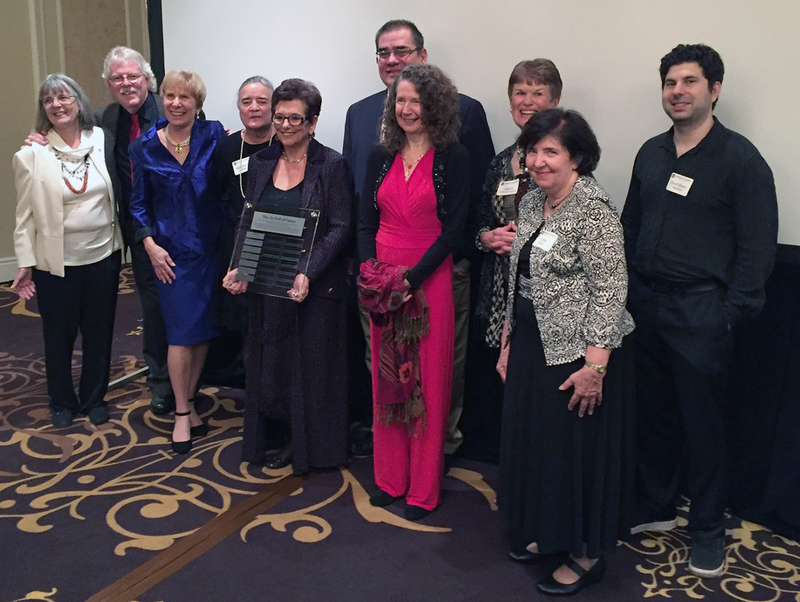 The picture here is of, L-R, newly inducted 2e Hall of Fame members Elizabeth Nielsen, Dennis Higgins, Lois Baldwin, and Mary Ruth Coleman; 2e Center Director Susan Baum and Bridges Academy head Carl Sabatino; Hall of Famers June Maker, Joanne Schwartz, and Linda Brody; and symposium speaker Scott Barry Kaufman. JONATHAN MOONEY spoke at the 2e Center symposium last weekend, and by coincidence just had an opinion piece published in The New York Times called "You Are Special! Now Stop Being Different." In it, you can read some of the points and stories he offered to the audience at the symposium. Find the piece. WEBINAR TOMORROW. SENG is offering a webinar on Thursday, October 19, titled "Empowering Gifted Learners Through Self-Advocacy." Find out more. ANXIETY is common among children in the 2e community. How do you help them? A New York Times Magazine article (ie, lots of words) might provide some hints. Find it. MedPage Today describes a Finnish study indicating that children born in the fall and winter have more ADHD. Find the article. The Child Mind Institute has posted an article about tantrums, outbursts, and defiance in kids with ADHD -- and how to help them behave better. Find the article. Science Daily reports on research indicating that children with ADHD) are likely to also have trouble with touch (tactile) processing. The study found finds that they fare worse on several tests of tactile functioning, including reaction time and detecting a weak stimulus on the skin (detection threshold). Find the study write-up. And Canada's CBC reports that "Children with attention deficit hyperactivity disorder may fidget, tap and swivel around in a chair much more than normally developing children because it helps them to learn complex material.." The research indicated that kids with ADHD move twice as much when learning. Find the article. TiLT's latest podcast is about advocating on behalf of differently-wired kids -- like yours. Find the podcast. HEALTH -- YOURS. Jen the Bloggers is offering an eight-week online course on self-care for the parents of complicated kids. Jen, who has 2e in the family, says she and her co-presenter "created what we would have wanted and needed. This is a course for you, not a parenting course. Our goal is to help you help yourself, because every family is different and the only expert is the parent." Read more. HEALTH: YOUR KIDDO'S. Blood pressure monitoring isn't only for adults. Hypertension in children and adolescents has been "on the rise" for decades, apparently, with approximately 2 million children diagnosed. Read guidelines for blood pressure in children. HEALTH: YOUR FAMILY'S. If you've wondered about the relative benefits of wild salmon and farmed salmon, we ran across an informative source about pros and cons; find it. THIS IS OCD AWARENESS WEEK. According to The International OCD Foundation, about 1 in 200 children have OCD, which the organization says is about the same number of children with diabetes. Find out more about OCD Awareness Week. READING, MATH DIFFICULTIES CONNECTED? Education Week wrote about recent research findings indicating that students with dyslexia often have problems with math, and that interventions helping one of the difficulties might help with the other. Read more. SENG "MINI-CONFERENCE." The organization Supporting Emotional Needs of the Gifted has scheduled a one-day conference for November 18 at Bridges Academy in Studio City, California. If you're in the LA area, find out more. MENTAL HEALTH CARE AT THE PEDIATRICIAN'S. The Brain and Behavior Research Foundation comments on research results released last summer on the effectiveness of interventions for anxiety and depression given in the pediatrician's office. BBRF says, "Children who received this treatment responded better than those who were referred to outpatient mental health care..." and that "One way to improve access to mental health care may be by delivering it at a place where children are more likely to visit—the pediatrician’s office." Read more. ALSO ON ANXIETY AND DEPRESSION, a new study has provided the strongest evidence to date that exposure to bullying causes mental health issues such as anxiety years later. However, the study also showed that the detrimental effects of bullying decreased over time. Find out more. AND MORE: Teenagers who start high school before 8:30 a.m. are at higher risk of depression and anxiety, even if they're doing everything else right to get a good night's sleep, a recent study suggests. Find the study write-up. AND MORE ON SLEEP. Australian researchers tracked over 3600 young people over seven years, finding that more than 25 percent reported sleep problems. Different factors seemed to cause problems at different ages, but the researcher noted that depression and anxiety were included among the causes: "It's a vicious circle. Depression and anxiety are well-established risk factors for sleep problems and people with sleep problems are often anxious or depressed." Read more. HOW MANY OF YOU are confident that you know how to bring up your children in exactly the right way? That's the lead-off question in a TED talk on parenting, inspired by findings in a 70-year longitudinal study of children in Britain. The parent/scientist/journalist talked about factors that seem to lead to "success" in child development -- such as parents talking to the children, or putting the children to bed at a regular time -- and also about factors working against success -- such as being born poor. However, while the line "choose your parents very carefully" got a laugh during the talk, even children born into poor circumstances were affected positively by certain parental behaviors. Find the talk, and know that (for those who read faster than they listen) there's also a transcript (although you'll miss listening to a nice British accent, which most of us in America enjoy). NEAR CHICAGO? Know that Scott Barry Kaufman, author of Ungifted: Intelligence Redefined, which has a message concerning learning differences and potential, is speaking at a free event on Monday, October 7, in Glen Ellyn. The event is from 7-8:30 and sponsored by the Glenbard Parent Series. If you're in the 2e community and haven't heard Kaufman speak, you're missing a treat. Find out more. THERAPISTS WHO WORK WITH KIDS provide 21 truths in a piece at BuzzFeed. The therapists in question are from the NYU Child Study Center and from the Mayo Clinic. Example: "Kids as young as 2 can start showing signs of an anxiety or a behavior disorder." Find the other 20. SCHOLARSHIP OPPORTUNITY. From NCLD: "The Anne Ford and Allegra Ford Thomas Scholarships offer financial assistance to two graduating high school seniors with documented learning disabilities and/or ADHD who are pursuing post-secondary education." Chances are you know such a student. Find out more. PD RESOURCE. Landmark College, which caters to students who learn differently, offers a variety of resources and PD for educators. An online course coming up is titled "Academic Strategies and Executive Function Supports for Students with LD, ADHD, and ASD." Find out more. GIFTED & DISTRACTIBLE, the newsletter from With Understanding Comes Calm, is out in its October edition. It starts off, "There is so much trauma in the world right now; nature-made and human-made. Anxiety reduces everyone's ability to be their best selves.This issue of Gifted & Distractible encourages positive assumptions, strengthening relationships and understanding our children/students so we can be there when they need us." As usual, the newsletter is filled with pointers and tidbits relevant to the 2e community. Find the newsletter. TiLT PARENTING's newest podcast is described this way by TiLT's founder: "Today I’m excited to be bringing to the podcast Peter Shankman, a multiple-startup founder, best-selling author, and the creator of Faster Than Normal, a leading ADD/ADHD podcast, focusing on the benefits of being gifted with ADD/HD, which describes who Peter is." Find the podcast. LOOKING TO HELP YOUR CHILD deal with his or her ADHD? Researchers have discovered that brief online or in-person behavioral therapy for parents is equally effective in improving children's behavior and parental knowledge -- a potential game changer for parents strapped for time and access. Read more. DID IT TAKE A WHILE for you to figure out your child's "e's"? Don't feel bad -- Tony Atwood, a prominent psychologist who is, according to the Guardian, "known for his knowledge of Asperger syndrome in children," finally realized when his son was 35 that he (the son) had Asperger's. The breakthrough: watching some old home movies that showed Atwood trying to interact with his 4yo son. His son eventually developed severe anxiety, then drug dependence, for which he has been imprisoned. Read the article. FEEL-GOOD STORY. A young woman with dyslexia struggled with science, and had a chemistry teacher who discouraged her ambition to be an anesthesiologist. Later, after having children, she decided to try nursing school. Go read a Marketplace transcript to find out what happened next. ANXIETY IN TEENS. From an NPR story: "Teens and children struggling with anxiety are often prescribed medication or therapy to treat their symptoms. For many, either drugs or therapy is enough, but some young people can't find respite from anxious thoughts. For them, a study suggests that using both treatments at once can help." Find it. BEAUTIFUL MINDS, the newsletter from Scott Barry Kaufman, is out in its October edition. It points to a variety of podcasts, interviews, videos, articles, and other resources of possible interest to those in the 2e community. For example, there's a pointer to an article on introversion and extroversion; to a video by Scott Barry Kaufman on the limits of IQ testing; and to an interview on the topic of grit. Find the newsletter. An October 5th webinar from Understood titled "Evidence-based Approaches to Help Kids with Dyslexia"; find out more. A live, free event on October 4th in Sacramento, California, by the UC Davis MIND Institute titled "Navigating a New Autism Spectrum Diagnosis." find out more. The microbiome and emotions. The Brain and Behavior Research Foundation has posted on how microbes in our gut affect emotions. Find it. Video gamers. Neuropsychologists let video gamers compete against non-gamers in a learning competition. During the test, the video gamers performed significantly better and showed an increased brain activity in the brain areas that are relevant for learning.Find the study write-up. SELF-CARE FOR PARENTS of 2e kiddos -- that's the topic of Jen the Blogger's latest piece.It's called, "Caring for Your Soul in this Age of Fear." Need that advice? Find it.